Writer's Café – Storylines (1) - You made it here. You must like books! After that, you select the kind of project you want to start, in this case: Storylines. Follow the wizard to enter the details you care to enter at this point (everything can be changed afterwards). Note that you need to enter at least 1 Storyline name when going through the wizard. at the top there is the Outline window on the left and the actual writing area on the right. 1 storyline called “Storyline” (or what you called it), and a block showing the first scene or chapter. 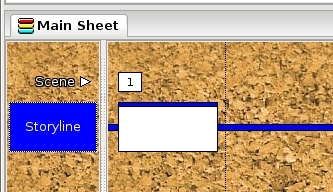 At this point things can become a bit confusing for first-time users: before you can write in the summary pane, you need to click the white block in this area, to select the scene you intend to write. Otherwise writing will not be possible. Try it. After clicking the block (be it chapter or scene), you can use the pane in the second image to can write your summary of the chapter or scene. In this example it is coloured grey (for easier reference). The first words of what you write in the summary will show in the white block of the last image, which makes navigating through the lower area easier. To write your actual story content, you click the “Content” tab (second image, over the grey area). If you do not want to grab the mouse all the time to switch between all the tabs, you can use F2 (switch to summary) and F3 (switch to content). F4 takes you to the annotations tab and F6 takes you to the report tab. And indeed, F5 does not take you to the properties-tab. More clever things to know: double-click the column to the right of the chapter/scene you created and a new one will be made there. You can also right-click there and select “New Card” from the popup menu. Through the Storylines menu you can accomplish the same, as with the Ctrl-Shift-C keyboard combination. More fun bits about Storylines in a later post.